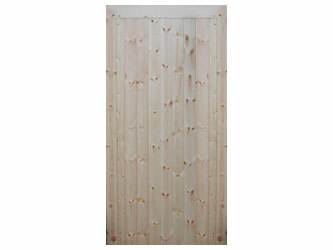 A Tongue & Groove boarded garden gate Ledged and Braced available in natural softwood timber and treated with a clear protim Prevac solution giving protection against fungul and insect attack only. Further treatment is recommended prior to installation. Recommended Gate Post size 4" x 4" and for height allow for 2ft more than the height of the gate for burial purposes.